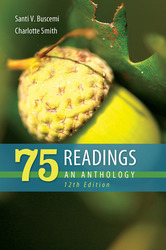 75 Readings introduces students to a range of classic and contemporary essays. The text also exposes them to a variety of rhetorical strategies, writing styles, themes, and topics. At the same time, it retains maximum flexibility for the instructor. These essays provide good structural models for rhetorical techniques and raise complex questions about current and enduring issues. More essays on contemporary technology; food production,distribution, and use; and cultural identity in America. Compelling Selections. Chosen after extensive research, the selections in this highly accessible collection have been proven - time after time and in classroom after classroom - to engage readers, as well as to inspire and serve as models for good writing for students with a range of backgrounds and abilities. Diverse Readings. Representing a wide variety of authors, disciplines, issues, and interests, selections address topics in history, sociology, psychology, politics and economics, linguistics, writing, aesthetics, criminology, biology, natural science, medicine, philosophy, African-American studies, ethnic studies, and manners and morals. Continued Emphasis on Mixed Mode. A chapter dedicated to mixing modes helps students understand how to combine patterns of writing to best achieve their writing goals. Flexibility. Rhetorically arranged and suitable for both one-semester and two-semester courses, 75 Readings offers additional tables of contents to fit a variety of teaching styles and course structures, including one arranged by theme and another by genre and discipline. Value. At roughly half the price of many comparable readers, 75 Readings is priced with students in mind. Two essays on global warming add coverage of this current topic of increasing interest to the argument and persuasion chapter. Santi V. Buscemi teaches reading, composition, and literature at Middlesex County College in Edison, New Jersey, where he was chair of the Department of English for twenty-eight years. He is the author of A Reader for College Writers, 75 Readings, and 75 Readings Plus. He has lectured on freshman composition and developmental education at regional and national conferences in the United States and South Africa.